Since the implementation of Baby Bullet trains in 2004, Caltrain has experienced continued ridership growth every year except year 2010. In 2003/2004, daily ridership was under 30,000. In 2017, daily ridership exceeded 60,000. Peak hour service has remained largely the same since 2005. To address the ridership growth short term, Caltrain purchased additional second hand rail cars. Electrification will be a key in the long run with faster and more efficient service. Besides electrification, additional improvements are needed along the corridor to further enhance train performance and capacity post-electrification. We urge Caltrain to plan for these improvements now to coordinate with electrification and prepare for future funding opportunities. 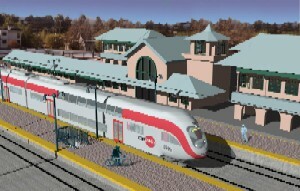 “Caltrain Metro” was a vision for Caltrain created by BayRail Alliance in 2002 that encompasses electrification, passing tracks, and other improvements to transform Caltrain into a frequent “metro” service with local and express trains. Platform extensions – Adding cars to trains can increase passenger capacity with no additional crews, while preserving train slots for future high speed rail under the blended scenario. Currently not all Caltrain stations can handle 8-car trains. Pedestrian grade separation at stations – Many stations have at-grade pedestrian crossings. Removing those grade crossings enhances safety and allows passenger access when trains are approaching the station. Level boarding – Level boarding cuts down dwell time and speed up overall travel time. It also improves access and safety for disabled and elderly riders, along with riders with strollers, luggage, and bicycles. Additional crossovers – Additional crossovers at key locations can allow service to recover more quickly. Replacing remaining diesel trains – The current project only has enough funding to replace 75% of it diesel trains. Replacing the remaining fleet between San Francisco and San Jose can further improve travel time and reliability.